At irocku we settle for nothing but the best rock has to offer; lessons that inspire you to practice and help develop your lifelong love for rock music. For this week’s piano lesson we bring you one of today’s most creative and unique personalities, Ben Folds. Rockin’ the Suburbs, is Ben’s spin on white, middle-class life, from his solo debut album, released on 9/11/2001. The ominous release date (same day as the terrorist attack) did nothing to dampen the success of this album and establish Ben Folds as a songwriter with a keen grasp on contemporary society and as a musician with limitless talent. Folds plays every instrument on the album, moving away from his weapon of choice, the piano, which was featured heavily in his band, Ben Folds Five. Rockin’ the Suburbs is a rollicking fun-filled musical adventure that reveals the pitfalls of growing up white and middle-class in suburbia, a place where most people think life is blissful. It also reveals that Ben Folds is somewhat of a comic genius. The song sweeps the listener along in an energetic pop melody explosion as if the band Weezer collided with Weird Al Yankovic resulting in a song of great musical depth and creativity. Check out the video for Rockin’ the Suburbs and you will see for yourself why the reference to Weird Al and Weezer is relevant. Weird Al, after all, not only directed the video, but also appears in the video. 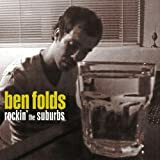 With that said, Rockin’ the Suburbs is an awesome song and Ben Folds’ reputation as a performer and songwriter continues to grow. In 2008, Fold’s released his, Way To Normal album, which charted at number 11 on the billboard top 200. Two more albums followed in 2009 and 2010, along with another album, Lonely Avenue and the huge YouTube hit, Ode to Merton in 2010. Ben Folds is on top of his game and continuing to evolve as an artist in a career that now encompasses a span of over twenty years. At 45 years young, Ben Folds has many years of memorable music yet to explore and record. In the meantime enjoy his masterwork from 2001, Rockin’ the Suburbs which is as American as apple pie! Ben Folds is as awesome on the drums as he is on the piano and he brilliantly uses the piano as a percussion instrument. This style is a departure from many of the other irocku lessons so be prepared for a new learning adventure! Second Week: Add the Exercise and Improvisation to your practice. Ben Folds uses the piano as a percussion instrument. This style is a departure from many of the other irocku lessons so be prepared for a new learning adventure! Level 3: The quickest way to rock is by learning the Groove Chart! To help with improvising, practice the C Major one-octave scale and learn the C Blues scale.First Week: Beginners practice the Lesson. Intermediate and Advanced students practice the Groove Chart and the Lesson. Level 4: The quickest way to rock is by learning the Groove Chart! To help with improvising, practice the C two-octave scales and learn the C Blues scale. Also learn the C, D7, F, and G chords.First Week: Beginners practice the Lesson. Intermediate and Advanced students practice the Groove Chart and the Lesson. Level 5: The quickest way to rock is by learning the Groove Chart! To help with improvising, practice the C two-octave scales and learn the C Blues and G Blues scales. Also learn the C, D7, F, and G chords.First Week: Beginners practice the Lesson. Intermediate and Advanced students practice the Groove Chart and the Lesson. Levels 6 and 7: The quickest way to rock is by learning the Groove Chart! To help with improvising, practice the C three-octave scales and learn the C Blues and G Blues scales. Also learn the C, D7, F, and G chords.First Week: Beginners practice the Lesson. Intermediate and Advanced students practice the Groove Chart and the Lesson. Here’s a fun version by Ben Folds. Rhythmically, ‘Rockin the Suburbs’ might be our most difficult song and you nail it. We can’t wait to see what happens when you cut loose and improvise. With that solid beat everything you do will sound good.